Every so often I cruise the web for new recipe ideas to expand my cooking repertoire. Brussel sprouts often get a bad rap, but I have a found a place in my heart for this often unwanted vegetable. I had some hanging out in my fridge waiting to be used, so alas, the search began. The recipe I found stemmed from a search I made for a recipe similar to a dish I used to pick up frequently from a co-op in Burlington, VT, the locavore mecca of the US. It was a tasty, yet healthy dish to pick up for dinner or as part of a quick lunch. That recipe called for pecans, but I found this one as a suitable substitute. 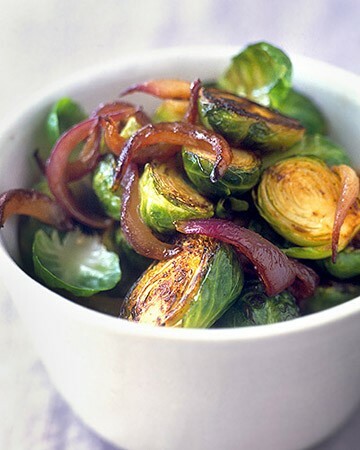 I was a huge fan of pairing of the glazed onions with the brussel sprouts. ﻿Quick, easy and saved in my recipe box for future occasions. If you are looking for a tasty addition to brussel sprouts sauté them with bacon. Bacon makes everything better and I love brussel sprouts but with bacon they are delicious.